Morning, are you ready for some w - i - d - e leg trousers? I do hope so because I'm sharing these extra wide floral pair today! 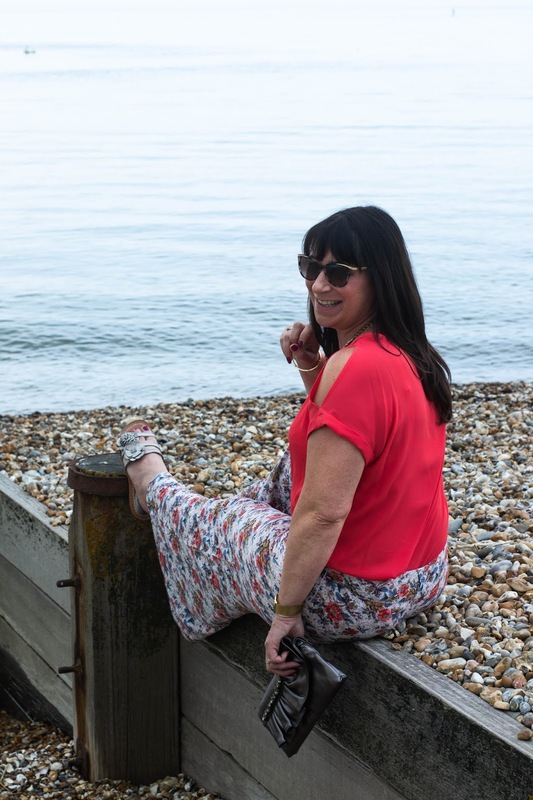 Also the #chicandstylish #LINKUP is live today, why not add a post of two? I had these wide leg trousers for quite a few years now, the girls bought them for me a few birthdays ago. I consider them quirky and they come out to play every once in a while. Today I've paired them with this gorgeous, deep coral pinky red top. I bought this especially to wear with the trousers, picking out the flower perfectly. I also like the cold should box style of this pretty top. Making it a summer must-have! 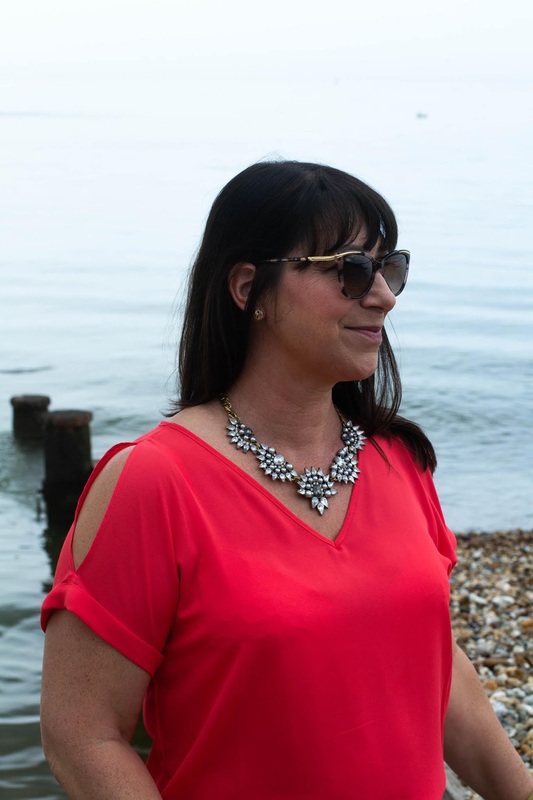 Choosing to wear a bit of bling with this trouser and top ensemble by way of this Happiness Boutique necklace. Having a pale blue stone it picks out the blue in my trousers. I paired my Clarks flat sandals with my trousers, I was going for a casual look, plus they are comfortable for all day wearing. I've worn these for a day on the beach and a little bit of retail therapy too. My Nine West clutch bag worked a treat for a stroll by the beach, I only needed my phone and some cash for a little refreshment. Hope you'll join the #chicandstylish #LINKUP. Don't forget to add a post or two below! Gail from Is this Mutton? is wearing a really unusual dress. I'm drawn to the two different patterns that look so good together - making her stand out from the crowd, which is a real shame as she's not feeling the dress is right for her - let's all shout together "yes it does Gail"!!! Many thanks to Esther Ruby for taking these fabulous shots, we had fun on our little afternoon out! Also having plenty of rain that day, but Esther managed to get all the outfits shots completed without getting too wet! Thanks for joining me today - can't wait to see what you've added to the link up! Labels: Fashion over fifty, Matalan, Nine West. happiness Boutique. Oh what a brave soldier you are to brave the rain for your beach trip, I would have stuck to the retail bit! I like that the top has a v neckline, so many cold-shoulders don't and Vs are always welcome in my world! Maybe the navy is still available? Wide-legged floral must feel so good in summer - I can't wear wide trousers (just call me Toulouse Lautrec!). 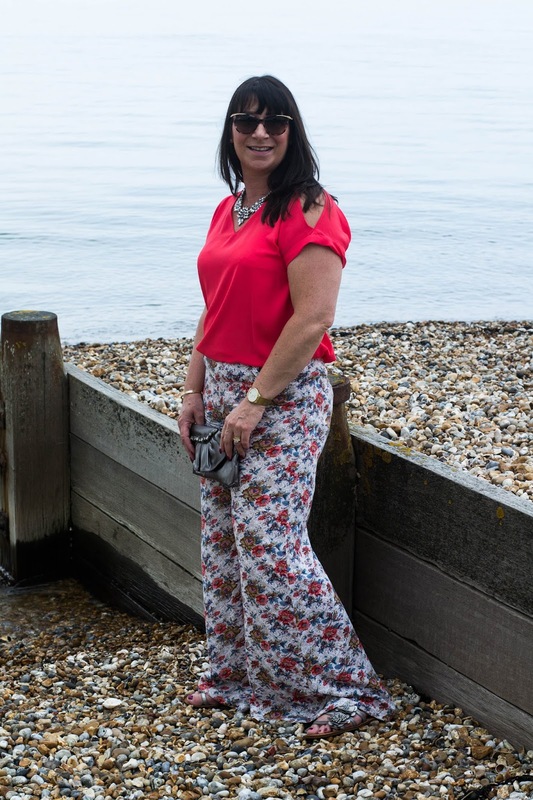 I love your wide leg trousers Jacqui, they are lovely :) Thanks for hosting, have a lovely Thursday. Jacqui, these pants are a little quirky and ever so fabulous! I absolutely love them! Perfectly paired with your cold shoulder top. And I love your little flower sandals. So cute! Really cute! Love those pants! Thrilled to be featured Jacqui, many thanks! 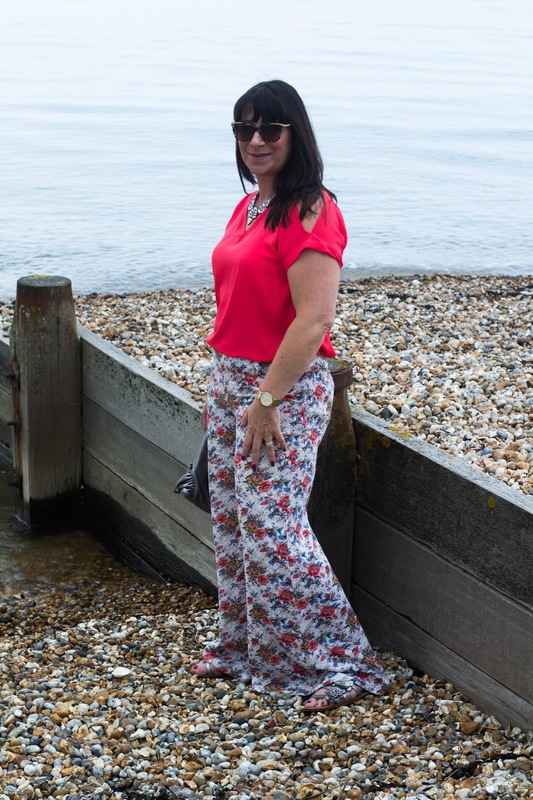 Great outfit - love the wide legged trousers and eye catching red top! I love the color of your top Jacqui! It's such a pretty color on you! I love the color in this outfit. These are fabulous trousers Jacqui!! Perfect for hot days when you don't want something tight!! These are fabulous festival trousers! Very summery! I have a jumpsuit with some wide legs, but I'd love a pair of trousers, too! 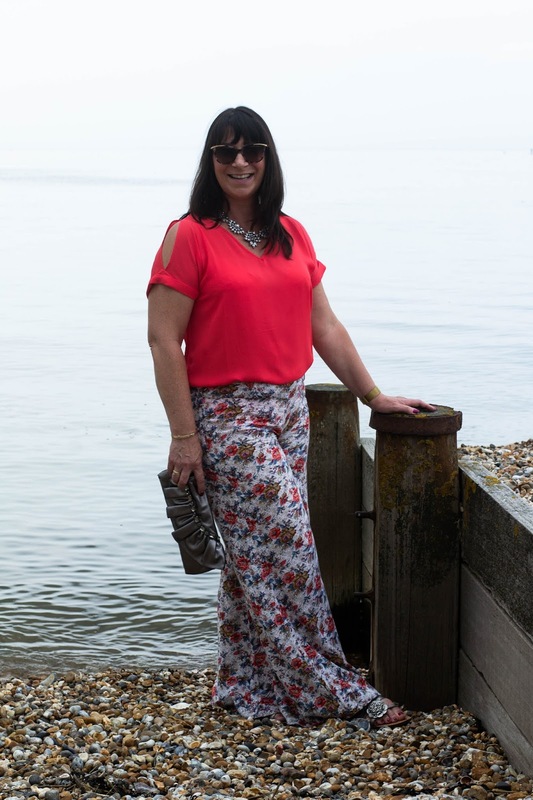 I love this bright top paired with the floral pants. I love those pants, they look so comfy but also chic. amazing. Have a great weekend! Fab trousers. I'm a fan of patterned trousers too. Great in the summer when you don't want your legs out. 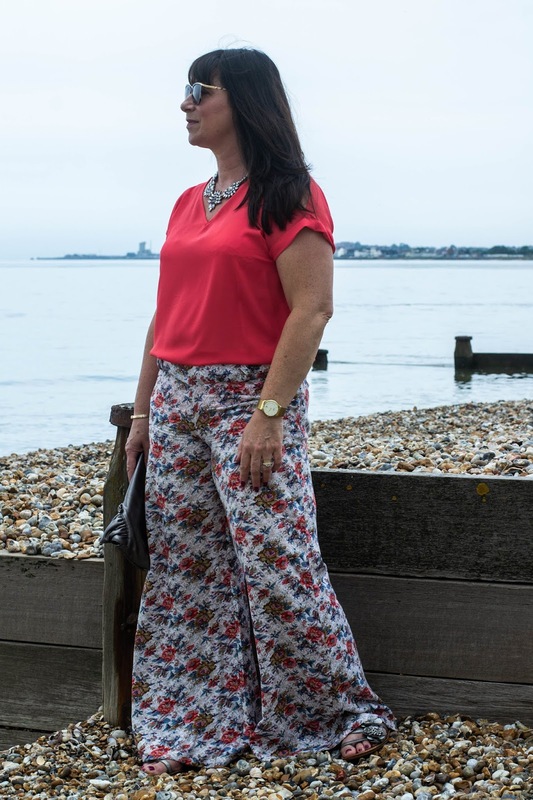 These wide leg trousers are so fun and pretty! Cute floral print and lovely colors. They look great with your cold shoulder top! What fun trousers! I love them. I also have a pair of wide legged trousers that I have had for several years, and I enjoy wearing them. I love wide leg trousers and they're so hard to find now. I'm not a huge fan of the skinny everything. Such a cue outfit together that just screams "summer is here!" Fabulous outfit Jacqui, especially the trousers! 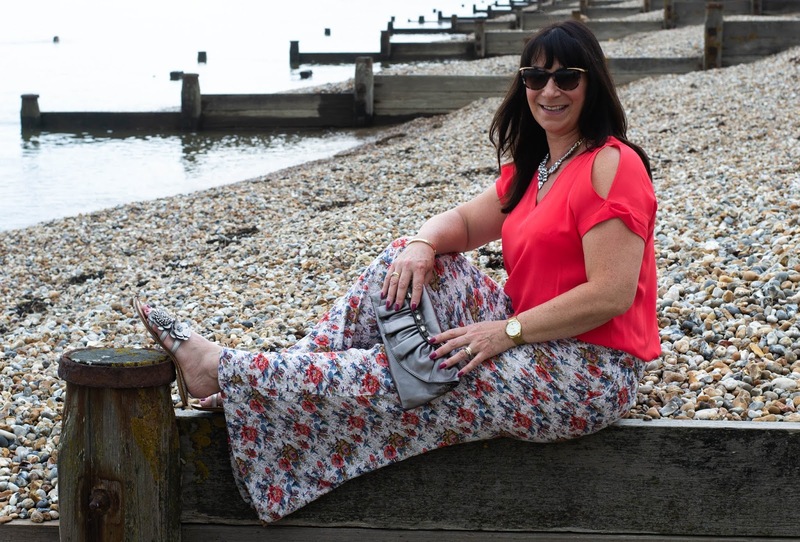 I've just linked up with a post on two new wide leg jumpsuits!